When you think about the Fourth of July holiday, what’s the first thing that comes to mind? Many of us think about cookouts, pool parties and of course, fireworks. While these are all fun things for us, each of these can pose dangerous risks for your pets. 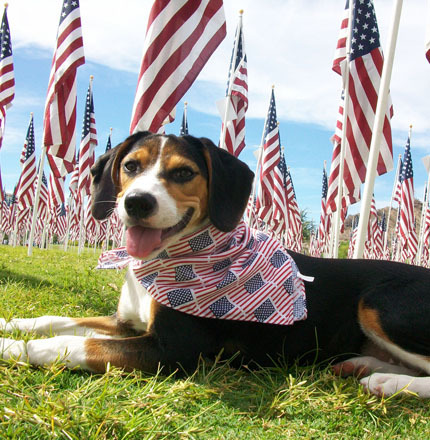 We want to make sure that your pets are safe during this year’s Independence Day celebrations and throughout the entire summer season. This year, the Independence Day holiday falls mid-week, on a Wednesday. While many of us may like the thought of a day off from work during the week, it means there are likely more days of fireworks in your neighborhood- probably starting on Friday or Saturday prior to the holiday, and running all week long. According to multiple sources, more pets are reported missing over the course of the 4th of July holiday than any other time of year- with a 30% spike in reports of lost pets to animal control agencies nationwide. I believe this number may actually be higher, as not all pets that go missing are reported to municipal agencies included in the study. Of course, the main reason pets go missing during this period is noise phobia brought on by fireworks. Last year, I wrote a blog about this topic– and it still is relevant today. For the purposes of this blog, I’m going to talk specifically about the risks of the 4th of July. For more details on controlling or managing noise phobias- see my other blog. With the increased risk of escape, it is important that your pet is microchipped. Microchips are still the most reliable way for your pet to be returned home in the event that they are lost. If your pet already has a microchip, please make sure the chip is properly registered with your current contact information. Stray pets are brought to Tampa Vet every week by good Samaritans to check for microchips. More than half that come in with microchips have either not been registered, or the contact information is outdated, which means the pet cannot be quickly returned home. Keep your pet indoors if you are planning on setting off fireworks. I have been fortunate that I’ve never treated a pet for a fireworks related injury. I’d like to keep it that way. However I have heard horror stories from colleagues about dogs with burns and worse when dogs think a lit firework is some type of plaything. Simply put, keep your pets away from fireworks displays. Even when they’re not lit, fireworks can still pose a hazard. Many contain toxic substances which can injure or kill your pet if ingested by a curious pet. If you’re planning a do-it-yourself fireworks display, keep them in a safe place until you are ready to use them and away from your pets. If you’re planning on attending a fireworks display away from home, leave Fido at home. Fido will appreciate it. Although not toxic, bones from chicken, beef or pork should be avoided due to a choking hazard. Garbage cans should be off limits to your pets, and extra care should be made when entertaining to keep your pet’s curious noses and mouths out. If you are having guests over, set the ground rules about the feeding of your pets. Make sure everyone knows that your pets are not to be fed anything besides their normal food. No chips and dips, no burgers, hot dogs. No human food, period. Be firm with your guests and make sure that human food is off limits to your pets. If you are planning on cooking on the grill, keep your pets indoors. Rambunctious dogs can easily knock over a standard charcoal grill and easily be burned. Keep lighter fluid and matches out of reach of both children and pets. 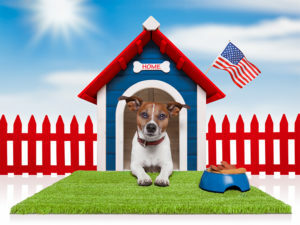 The entire team at Tampa Veterinary Hospital wishes you and your pets a wonderful and safe 4th of July Holiday.